To do whatever it is you need to do, good luck! You will receive a drink once you sit on the pillow (your turn) do not lose/drop the drink. It is required for Section 8. GAME: All SECTIONS ARE 30 SECOND GAMES! Once you're in this section the green tile will lead you to the one way gate. If you're not fast enough to follow it, follow the path shown below. Then enter the one way gate and wait for the round to end to be teleported. 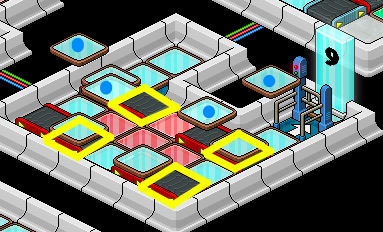 When the tiles are light blue, flick the switch to stop the colour tiles from toggling. You have to do it in 3 different sections to clear the path to the end. 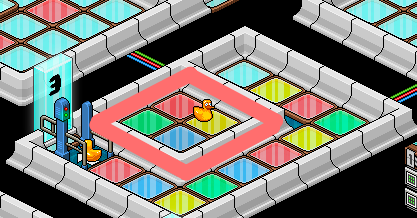 Walk on the colour tile when the duck is on the corresponding colour. tile, the gate will rotate. 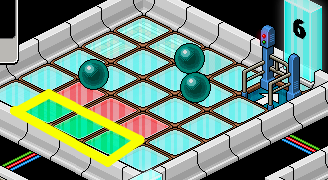 spots (in pink) Walk to the other side when the glowball is in the yellow spots. Get all the balls in a straight line by blocking them when they're NOT on the red tiles. Do not walk on the red tiles or you'll be teleported out. Once they're all in a line on the green tiles, the gate will be rotated. by any of the moving tiles or you'll be teleported back. The pocket spaces are safe. you walk on it. Once the tile is green, go to the one way gate. 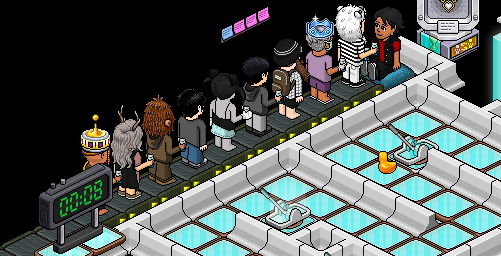 Walk on the moving colour tiles (do not step on the roller) when the tiles are on the RIGHT roller only! 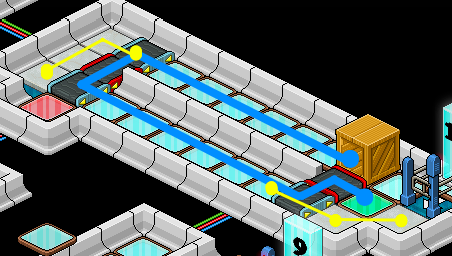 Say UP to teleport to the raised tile (highlighted in blue) Get to the end of the path, to get to the gate. Do not walk on any red roller or red tiles. highlighted (in yellow) to the greek seat to get ready to push the box off the blue roller. You will need to avoid the box from rolling on to the red tile. You will receive your hard earn badge when you complete all 10 sections! Does anyone know when this closes, I don't have time until Monday. Was a piece of cake once I stopped lagging. Love these events!